This guidance relates to logistics companies in the areas of freight forwarding, trucking, warehousing and order fulfillment. Supply Chain Services: Firms within the logistics sector are continually adding complementary services to fully manage customers’ supply chains. These services significantly improve company value not only in the eyes of customers but also buyers. Companies that offer the complete package command higher multiples than those who don’t. There are a variety of consulting opportunities, including logistic analysis, supply chain management and just-in-time (JIT) inventory management. Companies who do not have these value added services may be missing out on very profitable opportunities. Software & Equipment: Up-to-date systems and software are critical in logistics, an industry constantly seeking to optimize and improve efficiency. Specialized equipment for logistics and warehousing is also evolving, including opportunities with warehousing robotics. Computer systems must be able to handle the movement of goods. For warehousing, this is especially true for inventory management and retrieval. Whether companies are involved in freight forwarding, trucking or warehousing, customers demand the accessibility to identify, track and expedite items efficiently. Information systems can be pricey, however, companies that do not make ongoing investments may face buyer concerns. The need for extraordinary CapEx (Capital Expenditures) will be viewed negatively by buyers and will decrease sale price. 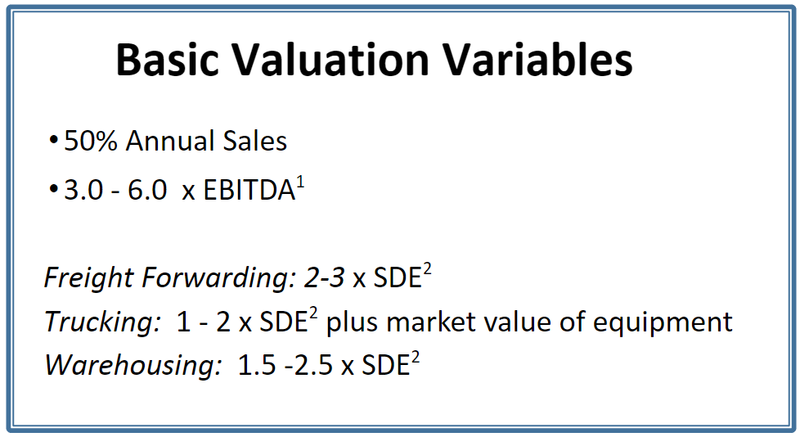 Inefficient systems and software will lower valuation multiples as well as weaken company profitability over time. Companies with sophisticated systems, particularly with strong customer interfaces, will obtain higher multiples. Improvement Cycle: Regular analysis of strengths and weaknesses within a logistics company is critical to long-term profitability. Logistics companies must constantly look to improve and evolve to keep pace with the overall industry. In addition to the technologies discussed above, a company must seek improvements in customer communications, procedural weaknesses and employee training. Companies who are able to demonstrate effective improvement cycles, as well as present any upcoming plans for improvements, will be rewarded with higher valuation multiples. Such analysis will also help to give prospective buyers a clear picture of where the company stands within the market. Management Team: Overdependence on an owner can manifest itself in a variety of ways, such as not developing set standards and training plans, failing to hire or develop management members or personally managing key customer relationships. A well-rounded management team will command higher valuation multiples and give buyers confidence that the business will continue to run smoothly after the owner exits. Set standards and processes are important in this lean industry, which requires high efficiency and depends upon well trained staff that can manage day-to-day operations. If management, or the company in general, is heavily dependent on the owner and seeks constant input, the final sale price and terms will be affected. The owner may be required to stay on for a certain period of time to help transition the business and implement systems. A company that is overdependent on owners may struggle to find willing buyers. Customer Concentration: Reliance on a few key customers will drive down valuation multiples and affect payment terms as it poses significant risk to the buyer. This is particularly true when customer relationships are directly tied to the owner(s) exiting the business. Companies sold with a high customer concentration often have deferred payment terms where the proceeds from the sale are paid over the course of years and vary based upon revenues and retention. Long-term contracts with key customers may negate risk associated with higher customer concentration. In general, higher multiples are awarded when no one customer accounts for more than 10% of sales. Problems may arise with prospective buyers if a customer accounts for over 30% of revenues.